The work done by scientists today is very different from that which was done say one hundred years ago. But, a short discussion of the history may be of some value. When a meteorite was analyzed fifty years ago or longer it was a matter of weights and measures and wet chemistry. Chondrite meteorites are still referred to as being H, L, and LL. These are classes that were established in the past based on bulk amounts of iron in metallic and mineral form in the rock. 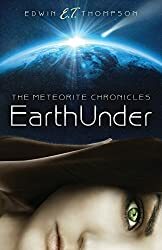 The H or high metal chondrites were given a range around 12% – 21% free metallic iron, the L or low iron stone meteorites were given a lower range around 5% to 10% uncombined iron metal. The LL group when analyzed back then had very little free metallic iron and very low iron in the minerals. Certain minerals were recognized to be present and it was known that they had different amounts of iron in their composition. So names like hypersthene and bronzite were connected to the names of the meteorites to aid in positioning meteorites into groups by composition. Above is an image of a chondrule within a chondrule. This is from a thin section made by the author of NWA 774 an H4 ordinary chondrite. Originally, the free iron percentage in meteorites was determined by crushing a carefully weighed sample into powder and extracting the metallic iron fraction of the sample and weighing that. The resulting percentage of iron long with identifying the main type of iron silicate mineral in the stone was the way meteorites got their classification. This is not the way it is done today. Here are just a few of the ways that the old method could produce ambiguities. First, the meteorite may not have the same amount of free iron uniformly throughout the whole mass. Obviously you do not want to crush and weigh the whole amount of a precious space rock. Secondly, meteorites begin to weather upon landing on Earth. Depending on the climate they can last thousands of years with the iron rusting little in a desert area, or they can lose much of the metallic free iron in a very short time if they land in wetter regions. The amount of free metal available to weigh by the old method can be greatly reduced through rusting in the stone. The third of this short list of reasons is the minerals could vary in composition and the actual iron amount was impossible back then to establish for a single mineral grain. Today, wet chemistry analysis and precision weighing have been replaced by a family of electronic devices that analyze the minerals directly. The iron content of specific minerals such as fayalite and forsterite is determined precisely for numerous points on a test sample and then averaged. The equipment used today is often an electron microprobe. A detailed discussion of its workings is beyond both the scope of this installment as well as this author’s experience. But, put simply a very fine beam of electrons is used to bombard a sample. Electrons in the sample are knock loose and particles with characteristic wavelengths for the elements in the sample are produced and analyzed. When the data is crunched the elements and their relative amounts in the sample are displayed. Errors from the effects of weathering are greatly reduced since the free iron metal is not involved at this point. The nickel iron metal can and often is analyzed using the same or similar equipment for research specifically on the metal. Today, classifications of meteorites list numbers for values of iron in at least two different minerals and an accuracy of +/- a small amount. These numeric values generally determine if it is an H, or L, or LL chondrite. Classification of other stone meteorite types will often use the same equipment but undergo other procedures also. Oxygen isotope analysis and rare earth element composition are only two of many other tests that a stone might have to undergo to be classified if it is a Martian or a Lunar meteorite. Trapped gases within the rock may be extracted and analyzed for their isotope ratios to determine where they originated. Different places in the solar system have different ratios for isotopes. The inert gases such as neon and argon may have two or more isotopes present in a sample and the various ratios of the daughter isotopes to the parent element may reveal much about the stone’s origin and past. This is especially true for meteorites believed to have been blasted off of Mars. The unmanned probes we have sent to Mars have analyzed the thin atmosphere there. So when gas ratios are found in meteorites clearly from a planetary body the case for Mars is further validated. One of the questions however, is when was the gas trapped? 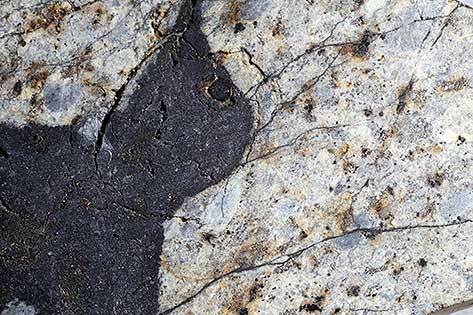 Are we sampling gas from billions of years ago when the rock formed or gas trapped when the impact occurred that blew the rocks from the planet? Mars’ atmosphere has undoubtedly changed since the rocks were formed and we have little knowledge currently about how much it has changed and when it changed. Still the data is often compelling for some of the meteorites, leading some scientists to think that the gases were trapped at the time the rocks were ejected because the match is very good to the atmosphere on Mars now. And other research shows that the time in space for some of the martian meteorites is quite short; at least in geological terms. 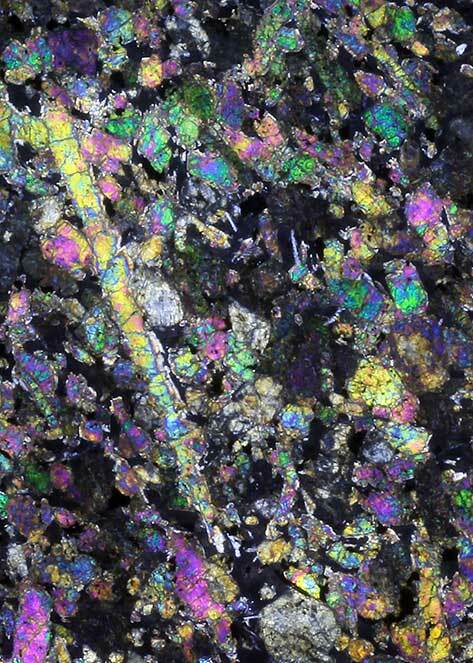 This image is from a thin section of Zagami a Martian meteorite. As can be seen there are no round chondrule structures. This meteorite is an igneous rock an has crystals of minerals instead of chondrules. One of the important areas of meteorite examination that has not changed too much in a hundred years is the optical microscopy work. Thin sections as they are called are slices of rocks that are ground and polished until they are only 30 microns in thickness. Many of the minerals will be transparent when they are that thin. They can be studied in both plane light and polarized light. They can be studied in transmitted light and reflected light. Scientist today still look for many of the features that would have been studied a hundred years, but also many more that have been discovered since. Mineral identification, the overall texture of the stone, the amount of recrystallization and related to that the state of preservation of the chondrules if there are any are a few of these features. New things like the evidence of shock which can be seen as lines called planar deformation structures in the mineral crystals will be looked for. This last one for example gives good information about the strength of impacts the body suffered while out in space. Other items can be studied as well in an optical microscope. Cleo Springs the meteorite show above is a H4 chondrite. 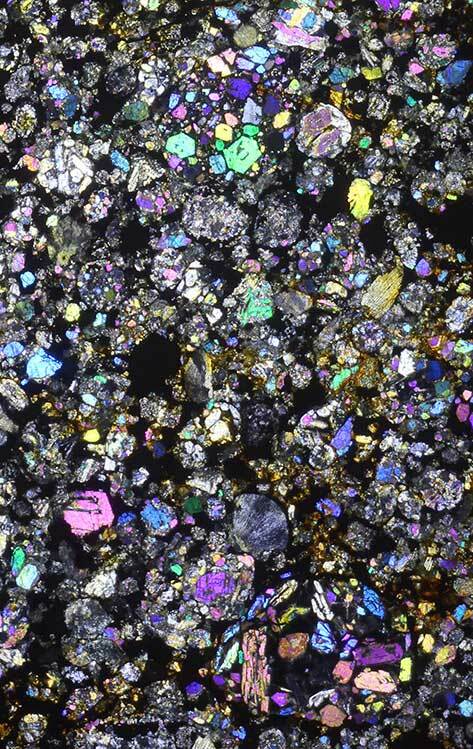 This image had many visible chondrules and many scattered crystals of olivine. The gray chondrules with the fan shaped radiating lines are radial pyroxene chondrules. Scientists when they receive a sample of rock will first determine if it is actually a meteorite. Thousands of stones are sent to research facilities every year only a handful are actually from outer space. However, after a stone is determined to be a meteorite it will have some characteristics not discussed so far recorded about it. The weathering state of the stone will be determined. This like everything else has been standardized to make worldwide understanding easier. The weathering scale when applied to chondrites uses mostly the condition of the metal grains found in the stone. Beginning with the freshest stones where all the metal is still present and there is little or no staining of the rock matrix from rusting, this is a weathering state W0. 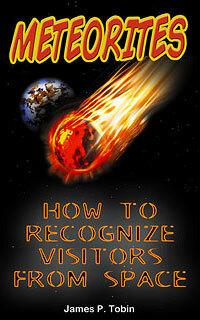 It is usually a meteorite from a witnessed fall found immediately that can get a W0. As the stone experiences more time and moisture the metal grains will rust staining the rock, the iron converting into other compounds that are not metallic. Even after all the metal is gone the meteorite will continue to alter until the very minerals of the stone have been converted into clays. As these changes are seen the weathering state number gradually moves up from W1 to weathering state W6 where it is barely recognizable as a meteorite. Mentioned earlier were the shock features that can be seen in a microscope while examining a thin section of meteorite. There is a scale similar to that for weathering for shock. It is designed to gauge the level of shock metamorphism displayed by the stone. A shock level of S1 therefore would be seen in a pristine meteorite that shows no shock features. An S2 however, would show under the microscope some uneven darkening of olivine crystals as the specimen is examined in polarized light and there might be cracking of mineral grains in along paths other than the normal cleavage of the crystals. In meteorites that have seen even more shock metamorphism there is melting of minerals and glass begins to appear. The metal becomes small blebs rather than grains. Finally, by the time S6 is reached most of the minerals have melted and recrystallized, often into polymorphs which are mineral with the same composition but having a different crystal structure. Polymorphs can only form under extraordinary pressures. Studying the shock features of meteorites gives science a look into the history of the stone. It reveals much about what happened to the rock as a result of collisions with other bodies out in space. The black mass in the image above image of Chelyabinsk meteorite is impact melt an area in the meteorite which was completely melted. Fine lines can also be seen some of these are shock veins. The stone is fresh, yet even so it still shows very minor rusting and staining around the nickel-iron grains. A much smaller number of meteorites are from the iron and stony-iron families. They will be analyzed using similar equipment to determine their composition. Trace element amounts for rare elements such as gallium, germanium, and iridium will be used along with percentage of nickel and visual crystal pattern information to place irons into groups much more refined than in the past. The inclusions and details of the crystal structure will be examined as well to seek clues to the formation and history of the meteorites. As with the stone meteorites there remains a place for optical study with irons and stony-irons, but advancements in technology have moved much of the work on these to specialized equipment as well. This has been a brief overview of the work that scientists do on samples of meteorites. Many meteorites are fairly common and do not show some of the more exotic features. But, each meteorite has it’s own story to tell and each builds our knowledge base of what is out there beyond the Earth. Asteroid sample return missions are already on the drawing boards and in the next few years we may be gathering our own samples from the solar system. Will these samples match what has fallen here as meteorites or will they be new and different material?